The milking center houses the parlor, milk house, utility room and office. DeLaval milkers are used in the parlor with automatic take-offs. Located in the basement are milk weight meters, pulsators and the pipeline. Milk weights for each cow are captured and downloaded to Dairy Comp 305 for analysis and herd information. Two bulk storage milk tanks hold 6000-7000 gallons of milk each. Both a chiller and plate cooler ensure that milk is cooled from a cow’s internal body temperature of 101.5 degrees to 36 degrees before entering the bulk tank. Free stall barns ensure the cows are protected from rain, snow and the hot sun. Curtains on the sides of the barns are dropped during hot summer months to allow natural ventilation and a cool breeze for the cows. On really warm days, a mist cooling system ensures the cows remain comfortable. 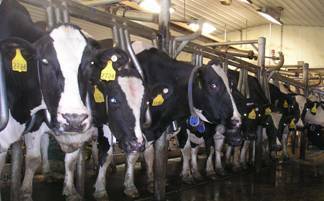 Soaring Eagle Dairy has 3 cow barns; two for the milking herd and one for special needs cows that will be having calves within the coming two months. All cows are housed in free stalls, meaning they are free to move about the pen as they like. Cows can choose to grab a bite to eat, get a drink or take a nap. 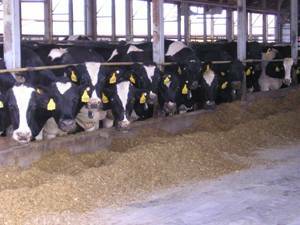 “Life is a Beach” for cows at Soaring Eagle as cows spend their time lying down in an ultra comfy bed of sand.